Team building and creating teamwork in that team are two different things. Similarly, it is completely different to perform as a team member. He enables smoother movement towards the goal and helps the team to overcome obstacles. The synergies attained by teamwork are what have made the concept of teamwork popular and relevant. It supports a more empowered way of working as a team and removes the constraints which prevent a person from doing their job properly. It promotes leaner structures and reduces unnecessary hierarchy. It also promotes a sense of achievement and good camaraderie which is essential for a motivated workplace. Targets are to be met and revenue needs to be generated. Tasks cannot be kept pending and they have to be completed within the prescribed time frame. A thought can be discussed amongst the team members and the output is the best possible solution. A person who is individually and single-handedly responsible for a task will definitely take more time to perform a task as compared to when it is given to a team. Team members help each other and together they attain the goal. If the person who deals with an important client falls sick or is unable to attend to him due to any reason, the work will take a backseat in such a case. However, if the team works on it, other members of the team can help him in that task and also deal with the client in his absence thus not letting the work suffer. However, despite the above-mentioned benefits of teamwork, it is not easy to make the team work together with peace. Teamworking skill is not any usual skill which every employee possess. This is one of the important skill which many employers look for while hiring. Usually when working in a bigger organization, one needs to be a part of the team and work with the team to complete the project. But if the employee lacks team working skills, then disputes and improper communication can lead to disturbances in the team and can hinder the path of project completion. This can result in missing the deadline of project completion and finally can impact the whole business or organization. That is the reason why interviews nowadays have turned so complex, as employers not only want employees with a good subject but also check for their behaviour and attitude during interviews. As a bad hire can affect the organization in a negative way. Teamwork is the key to success. The following mentioned are few team factors and teamwork tips that inculcates teamwork skills for those who are working in teams. If the team members remain fixed and same, it helps in developing a bond between them. They get to know each other better and the relationship results in better projects. It also helps in dividing the work amongst them easily if they know the people who are working with them. The better they know, the better it is to work with them. If the teams are formed only for one project, they know that it is only for a short time and they will end up behaving poorly and the output is not up to the mark. Give the team members a chance to evaluate their peers, the contributions of their team members after a project. Say, let them assign it in a score like 50% or 80%. Ask them to rate them and also justify the score. It helps a person to know what they contributed and how are they evaluated for it, how can they improve the contribution et al. Keep the score only for developmental purposes and do not let any animosity seep in due to that. Do not take it for official purposes. It helps in their annual appraisal as they get to know the work evaluation beforehand and can improve it before the final review. Help the members get to the same wavelength before they settle down for business. Get them to develop a concept map of their plans for the future work and then get it submitted. This also helps them in planning ahead and then you get to see if they are in the same line as you think. If the team creates an environment in which people are comfortable with taking reasonable risks, it helps them in creating a trusty environment. They can take risks in communicating, advancing positions and also in taking actions. However, understand that the team members should not be punished for failing in small risks or in doing a mistake. Create an environment where the teamwork and communication is open, respectful and honest. People should feel free to express their thoughts, solutions and their opinions. When people feel they are being heard and respected by the team members, they feel good. When a team member tries to understand them, they feel free in expressing their thoughts. Team members should ask further questions for clarity if needed and then spend their time in listening to the speaking member rather than forming conclusions before listening to them. All the team members should be viewed as different and unique people who have the irreplaceable experience to share, the point of views and opinions to contribute to the team. The main purpose of forming a team is to leverage the differences of opinion of different members and it should not be lost. In fact, the more divergent views a team’s member have, the more thoughtfully they are presented, more better. For the team to succeed, it is important that each member knows the team roles and responsibilities, his as well as others’. There should be clear demarcation and complete clarity in the team members as to who is responsible and for what. Authority overlaps should be avoided and if there is a risk that two members would be competing for control in any area, try and divide it beforehand. Divide it in two distinct parts and then give each complete authority over the task. It should be based on the person’s competency and personal inclinations as well. However, sharing duties or work when a member is away is also important and if a person doesn’t have the necessary aptitude or skill to perform a task, he should be helped and provided the required training as well. Many issues need team consensus and commitment and for such tasks, involve the whole team in the decision-making process. For example, you can use group sessions and involve collective discussions for possible solutions and solution ideas. What needs to be felt is that each member should feel his/her ownership in the final decision and the solution. The more a member feels this way, the more likely he/she is to agree and commit to the final decided line of action. Assess how an employee contributes to teamwork success as a part of the business annual review. It means that this should be a parameter in the annual appraisal process. Let everyone know that their performance will be assessed and they are expected to cooperatively work in a team. When you acknowledge workers for their efforts, it provides the members a motivation to become a better team player. It could be something like an award named team player of the year, a small cash award or a certificate. Just appreciate them and see the difference. The team should be able to discuss the normal norms for their team and also what is holding them back from moving forward and progressing. The progress should be reviewed regularly and the issues, the conflicts that arise should be dealt in a positive manner. If a common resolution cannot be reached, you can ask for help from the senior. Constructive feedback should be given to the members and the team should focus on ideas, behaviours, positive actions and suggestions for improving them. The essence is that everyone should focus on helping each other and developing and executing team success strategies to achieve the goals. Good teamwork needs trust and it can be gained only when each member demonstrates their accountability for the assigned work. Team members who trust each other also share their ideas and respect each other’s feelings. A great way to build trust is to spend time with your co-workers outside the office and use this time to get to know each other better. Talk and discuss about the strengths and weaknesses. It will also help you in playing to each other’s strengths in the workplace. Hence it is a win-win option. 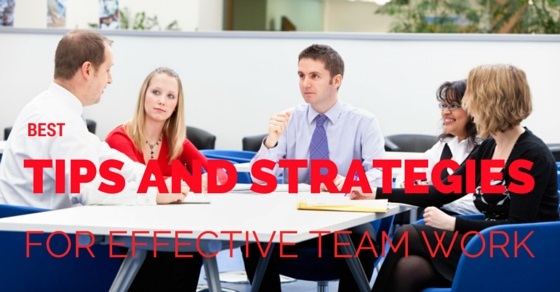 Make sure that the team has devised common ways to analyze and resolve common teamwork problems and conflicts. The team members should not support any member personally during clashes and also not take sides during a disagreement. Rather, they should work towards resolving it mutually. Participative leadership should be practised in meetings, task assignments and in the recording of decisions and commitments as well. The team should constantly evaluate and examine itself to improve. The members should make decisions together and also support each other in those decisions. The members should have a sense of belongingness to the team, to the group and it is enhanced further when they spend time discussing the work together. Teaming is not effective in all situations; however, when you decide to go for it, the above points should be kept in mind to keep everyone involved in it. It increases business productivity and produces better solutions to problems. Companies that foster a collaborative environment are the ones that succeed in the business world. Hope you will get some tips from these points and will face no problem in fostering effective teamwork in the future. Previous articleHow to Find Difference Between Good and Bad Company?